If you have a Precision exercise pen, doesn't matter what the hight, and you buy one of the size of 24 inches in hight, you can take apart the 24 inch pen- so that you have two segments consisting of 2 panels. 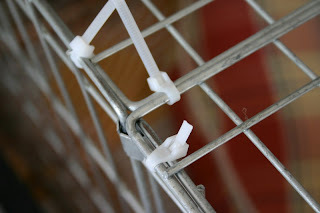 Then if you zip tie the two segments together so they form a square of 4 segments, you can then zip tie this 'roof' to the top of your original x-pen when it is in the shape of a square- you will leave one segment free of zip ties to be used as a 'door'. Once you have completed zip-tying, remember to cut off the hanging bits. 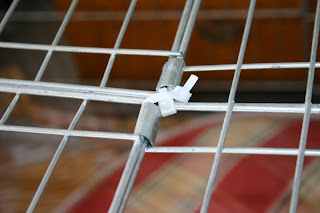 You can use the fasteners that came with the x-pen to lock the 'door' when you leave the dog alone. 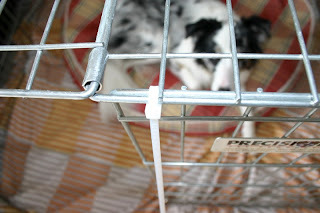 If your dog is not yet house trained you can try this method of preparing the base of the crate, this particular method is for a dog that doesn't like chewing and tugging. For a dog that might eat the base, you could use a piece of linoleum. 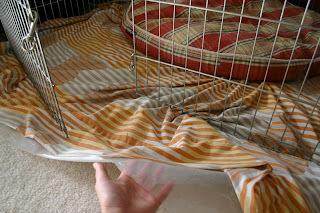 AND for dogs that are strong and learn how to lift the crates up and squeeze uder, you can create a secure base in the same way you created the roof- making sure to line it so the dogs feet aren't on the metal grate. You can buy tops to the pens, but they are 50$ a cover, and the medium size 24 inch pen is 63$- which you can make 2 tops (or a top and a bottom from), so is a better deal. 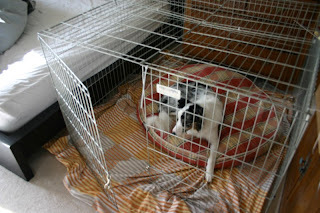 If you need to leave your puppy in a safe environment but are unable to return to let the puppy out to use the bathroom, you can put a square of grass sod in one corner of the pen (preferably in front of the door, as that is were they will be most likely to go, bed to the back), or a pee pad in a litter box. Grass is way better to use than pee pads as pee pads can actually train your dog to pee on anything that resembles a pee pad- for instance white t-shirts on the floor of your bed room, your pillows, your sheets, your bed etc. Here you can see an example of what do with a little dog with extreme toilet issues. You can create a crate that only has a bed and a toilet. 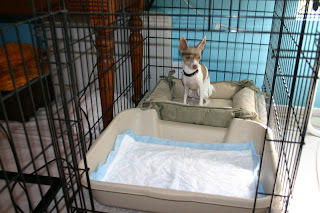 You can also create a exercise pen that consists of one small bed and the rest of the pen- pee pads. Then all you have to do is reduce the pads to just being in one of the corners of the crate. P.s. Crates are a training tool. The goal is to train your dog to be calm and loose in your house. The more choices a dog has during the day, the less hyperactive and frantic the dog will be when you return home. 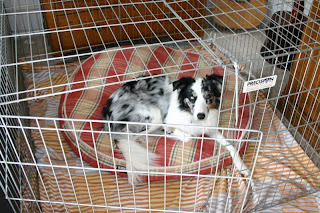 Crates are useful when you don't yet trust the dog to not destroy your house, or your dog is not house trained. 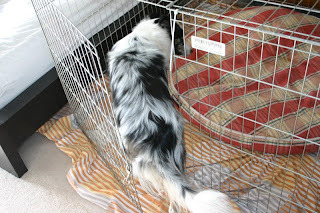 It is essential to teach your dog to love crates regardless of if they need one at home so that they are comfortable when they have to stay at the vet or in an emergency situation- like Hurricane Katrina. My dogs are both loose in the house now that they are trusted. 1. can kiko do the same complex tricks as splash? I know borders are considered the smartest breed, was curious to see if you feel the same. 2. how can we use clicker training to house train dogs? I'm thinking, click and treat when the dog goes poo or pees outside, but does that mean they won't do it inside? Since you can't "punish" how do you prevent this with your methods. 1- Kiko has no ankle joints, and is going blind in one eye, and has issues with holding things in her mouth. She also has only one or two teeth. When she was a pup I tried to get her to work for toys, but it was difficult with her loose teeth and painful mouth. So, yes, there is a disadvantage as she can only eat a spoonful of food a day, where splash can keep working all day for the same toy. I can't think of a trick that kiko could potentially learn, that splash knows, however, it would take longer to train. BC's arent 'smarter' in the sense of how Im thinking, they just find working more reinforcing. Kiko generalizes behavior modification WAAAYYY faster than Splash! I have an article in this blog on house training, read it for how I would teach it. Thanks Emily. You are the best. I love your videos. I love your sod in the cage idea. Brilliant. I live in a condo, it takes a while to take the dog out from my place to the front door. I look forward to trying it out. I need your advice. 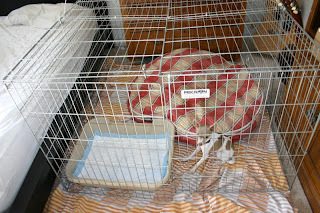 How did you crate train your pups? my tends to whine alot when i leave her in there. So i have been sleeping in plain view for her to see me. Am i creating a dependency on me there? Also, she's 8 weeks old, when I put her on a leash she doesn't want to follow me, her food drive is kind of weak right now, so she's not doing anything she can to get the food in my hand. she gives up. What do you feed your dogs on a regular basis? not sure if you gave them permission. i tried the sod thing. oh my god, disaster! she picked it up and flung it around! lol. When Dog runs around to much can it topple the pen and escape? I need some help with toilet training. I have a yr old rescue dog. That Ihave been trying to train to go on a pad for a month with little success. She holds going to the bathroom from 12-14 hrs! until she is alone. I am afraid she will make herself sick holding it so long. Crate training didn't work because she waits until I finally fall asleep and then soils in her crate. I switched to a pen with pads which she uses randomly. So it is impossible to gradually reduce the pads. I am afraid she is not making the connection of what and where I want her to go because I can never praise her. I don't want her to have to live in a pen forever or only be teathered tto me on a leash. Any suggestions would be greatly appreciated. something I do created this, and this is when I need to move him to the crate. But, I don't want him to "think" that dogging me in the kitchen equals the xpen full of good stuff. 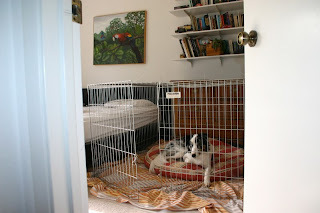 This is a great way to keep puppies, chickens, bunnies, or any other pet or even child in. It stands about 2 ft tall. It has a screen door that can be open by a zipper. As a safety measure the zipper can be clipped closed. The two ends easily snap together with clips. It has an awesome carrying bag that has two straps for carrying. There is also a way to strap it down to the ground if outside with stakes if wanted. I was shocked at how large it is. My kids like to play with it but when they aren't playing with it, as use it for our chicks to allow them to get some sun safely. It's really a nice and helpful piece of information for dog create.